With only 47 days left in 2013, it is a good idea to start thinking early about what you’d like to accomplish in the New Year to improve your money and personal finances. Here are four “power” questions to consider if you really want to make 2014 your best year ever! What do you want to accomplish THIS year (2014) with your money? What could you do to DOUBLE your savings in 2014? 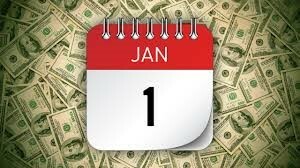 Share with your spouse or significant other what specifically you’d each like to accomplish this year with your money. This will open up the money dialogue and get you both on the same page. Then, create a written list of the top four to five things, prioritizing by importance so you know which to tackle first. For best results, accomplish the #1 goal first before moving on to the next one. Accomplishing one new goal with your money in 2014 is far better than “not quite” accomplishing any of them! Discussing together what frustrates you the most should get you fired up to make some changes in the New Year! Stop settling for mediocrity when it comes to your financial future. What frustrating money habits will no longer be acceptable for you in 2014? As a nation, we are encouraged to spend and consume. Trying to “keep up with the Jones’s’’ leads the majority of families to live paycheck to paycheck. It is time you realized that you are in charge of your personal economy! Nobody else will encourage you to save more, live debt free, pay cash for vacations, and someday enjoy the financial freedom few others will have. So it is up to you, and that means saving more, and saving consistently, every single month. What could you do to double your savings? Then, looking at question #4, map out new habits or strategies to make it happen! Personal finance is mostly about behavior and choices. If you don’t have much money in the bank, look at the choices you have made, and start making better choices. Change your behavior and your money situation will change too! A goal without implementation doesn’t do anybody any good! What happens if you DO NOT do this? You’ll simply find yourself repeating the same goals, year after year, growing more and more frustrated at your lack of financial improvement! Don’t “wish” you had done more in 2014 as you watch the ball drop in 2015. Discussing these four “power” questions with your spouse before the New Year comes, will ensure you hit the ground running for a better financial future for you and your family…NOW! This entry was posted in Blind Spot 1: Developing a Plan, Blind Spot 2: Increasing Fiscal Literacy and tagged blind spots, finances, financial future, financial planning, goals and dreams, lenders, money, mortgage, Portland Real Estate, Refinancing, saving, wealth. Bookmark the permalink.